Dying for pearly whites that belong on toothpaste commercials? Jealous of the perfect, sparkling white, chiclet-shaped teeth seen all over Hollywood? Look no further than GoSMILE Lemonade Smile Luxury Toothpaste. I first came across this amazing little tube as part of the 5 Senses Toothpaste Kit. And I must say that within one usage, I was completely hooked on the tasty formula. It brightens, it whitens and it seriously tastes terrific. And if you're worried that your teeth will suffer without Crest or Colgate, stop that right now! GoSMILE's Lemonade Smile is formulated with fluoride to prevent decay and strengthen your tooth enamel ... and the lemon extract and lemon essential oils add such a satisfying burst of citrusy freshness. As an added bonus, 5 percent of sales from each tube will be donated by GoSMILE to Autism Speaks. 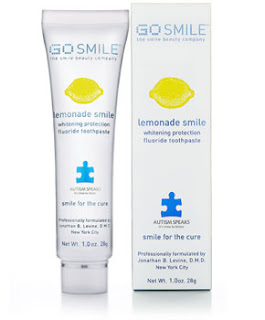 GoSMILE Lemonade Smile Luxury Toothpaste retails for $16 at beauty.com.